A modern design classic made in Switzerland since 1963, USM Haller continually represents high quality, precision and growth into the spaces of the future. The basic element of the construction is a chrome-plated brass ball joint. Chromed steel tubes connect to the ball to form a stable framework in which the powder-coated metal panels and internal organizational elements are mounted. 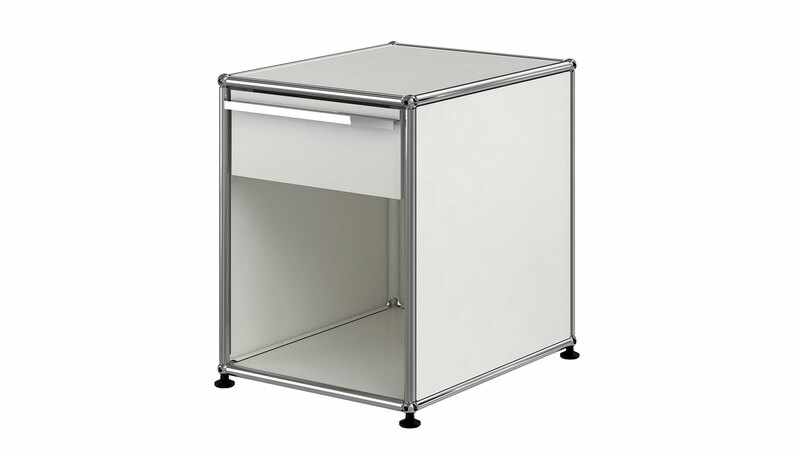 The Haller Nightstand A features one 6" drawer. A wide selection of finishes are available. Pure white, USM green, and graphic black finishes are available through a Quickship Program with a lead time of 2-4 weeks. Light gray, anthracite, golden yellow, and USM ruby red are available in a standard shipping time of 14-18 weeks. Manufactured by USM.